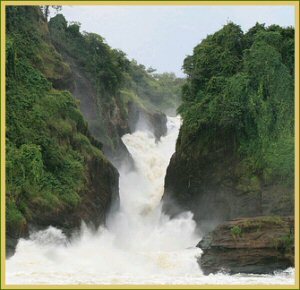 Murchison Falls National Park covers an area of 3,840-sq km with altitude of 619m at the delta and 1,292 at Rabongo Hill. The mean temperature is 29 째 and 21째C-low C-high. It has recorded 76 mammal species and 450 bird species and is known to be the biggest national park in Uganda. Early morning after breakfast, group is picked from hotel in Kampala and drive via Bombo and Masindi town to Murchison falls National Park. Have either lunch in Masindi or a picnic lunch in Kaniyo - Pabidi forest. Proceed to kichumbanyobo gate accessing Murchison falls National Park late afternoon. Drive to the "Top of the falls" for a breathtaking sight of the raging Nile and witness it forcing its way through a rocky gap barely six meters wide, point where the Nile River detonates through a narrow gorge and cascades down to become a placid river. Have Dinner and over night at Red Chillis Camp with basic accommodation, sambiya river lodge with mid range accommodation and luxury accommodation package being at paraa safari lodge / Nile safari camp. Morning at leisure, drive back to Kampala and lunch on the way.